Situated in the Baramula district in Kashmir is the beautiful Gulmarg City. The finest and the most beautiful mountain resort has an unparallel beauty and charm. It is famous for its close proximity to Srinagar, for its slope resort and legendary beauty. The cool atmosphere and immense greenery makes it a worth visiting place. If you are looking to book Gulmarg tour packages at cheaper rates, you may choose Dal Lake Holidays, the best tour package company offering a distinctive travel experience. 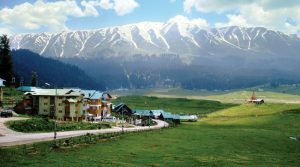 The term ‘Gulmarg’ means the ‘meadow of flowers’ and so the magnificent and undulating towns of Gulmarg is foliaged by wild flowers of the summer and the Spring. Here you may experience unaggressive architecture that seems to blend fabulously with the terrain. Languid curves, wooden houses, easy dips are some of the specialties. To book Gulmarg Tour package you may talk to one of our agents. Dal Lake Holidays gives you a chance to see all the beautiful places of Gulmarg. Book now to get attractive discounts!